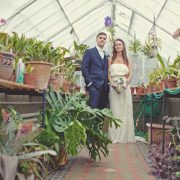 Both Ben and I are from the Tunbridge Wells area we and wanted to hold our wedding locally. 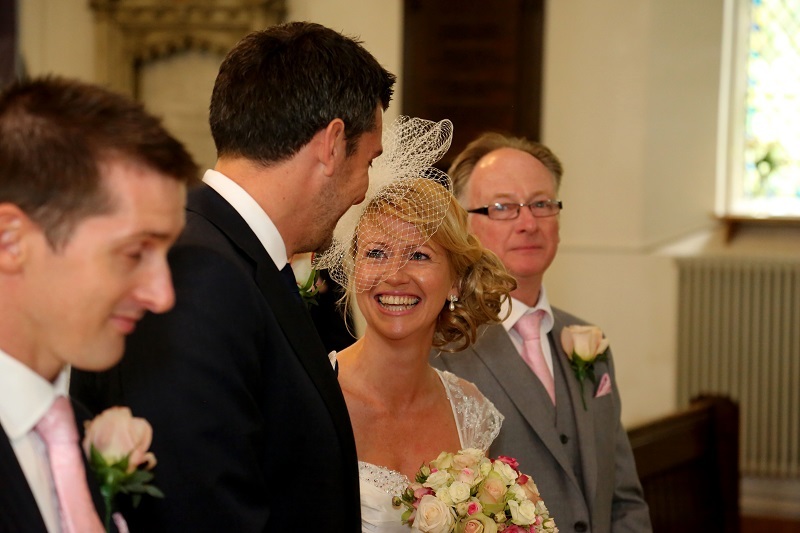 We married at St Alban’s Church, Frant, just outside Tunbridge Wells. The vicar and the church community were very welcoming and it meant so much to us to be married in such a friendly place. 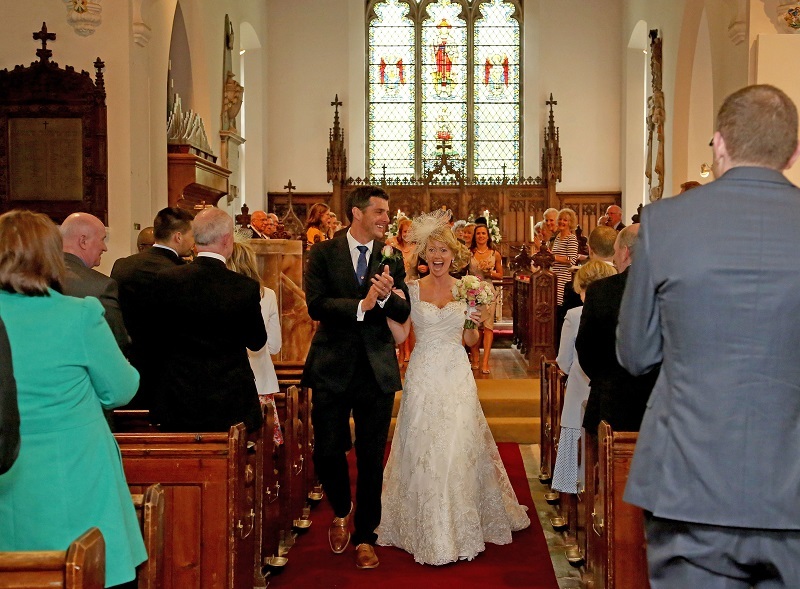 The service was emotional – tears and laughter from Ben and I – we just about got through the vows! The Royal Tunbridge Wells Choral Society performed for us – encouraging the guests the belt out the hymns! 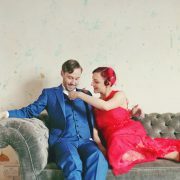 I loved my dress and wore ‘Sapphire’ from Ian Stuart’s Killer Queen collection. 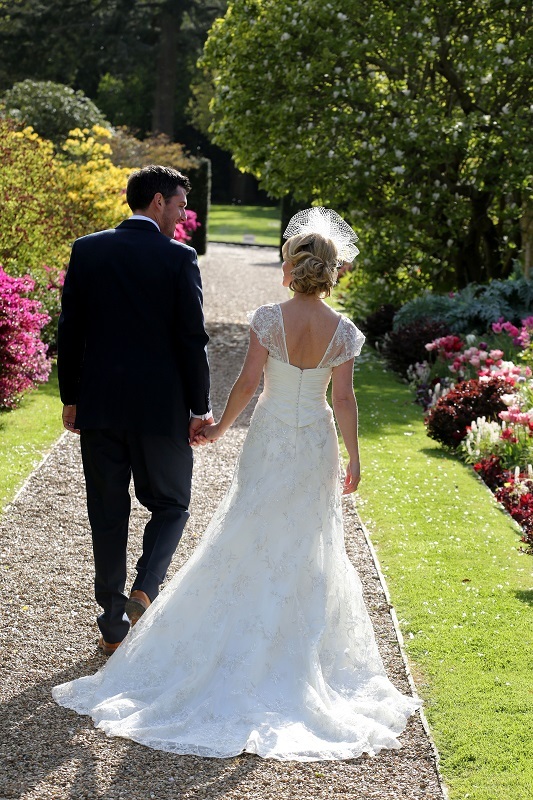 Purchased at Pantiles Bride in Tunbridge Wells, Maria and Alex made the experience so memorable. Alex used lace from the hem to make me sleeves which really made the look come together. The sleeves were so unique and pretty. I also wore a headdress made by Rachel Trevor Morgan – who makes hats for the Queen! I knew I wanted something unusual, not a traditional veil, and when I tried on Rachel’s pieces I fell in love with them. 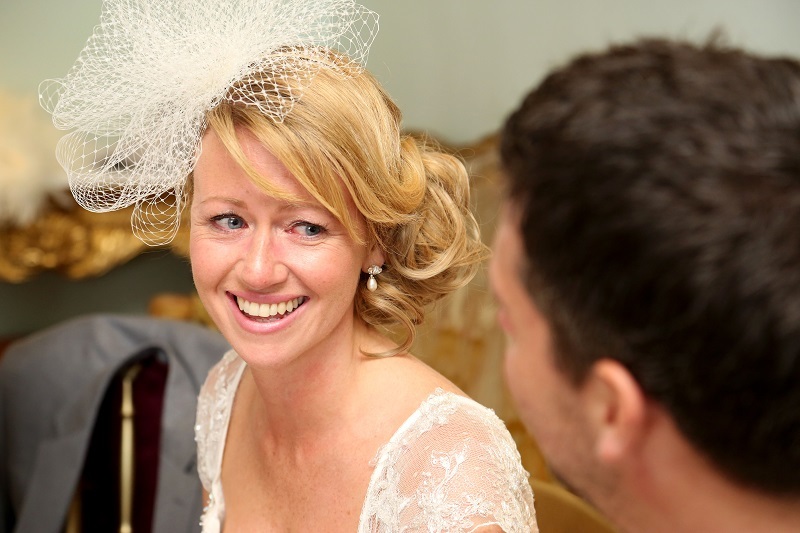 The birdcage veil design I chose was dramatic – perfect for the church. I would definitely recommend my Rachel Simpson shoes because they were surprisingly comfy – and beautiful! My bridesmaids wore dresses from the Monsoon bridal range and wore matching shoes, shrugs, handbags and necklaces. They all looked stunning. 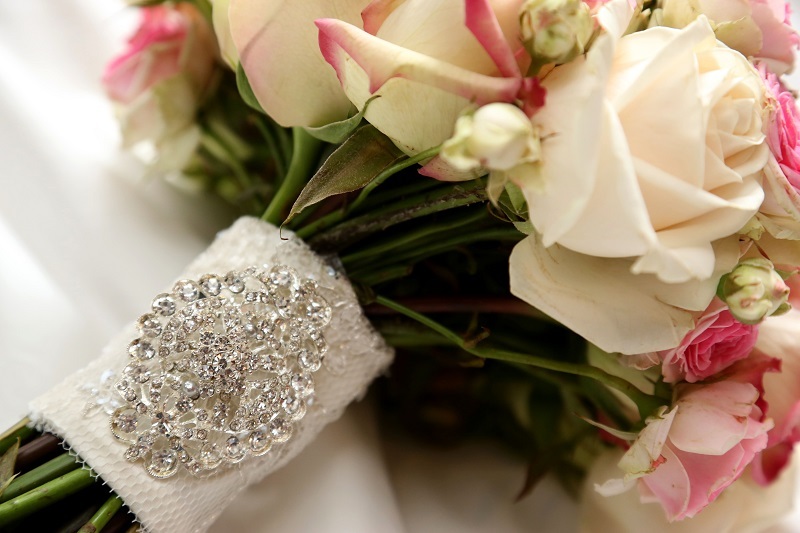 The silver dresses matched the silver stitching in the lace in my dress. I love each and every one of my bridesmaids and had personalised messages framed for them as presents. My lovely uncle, Tony, works at a Tailors in London and when we got engaged immediately offered to supply the suits. Ben and my dad had three piece suits made to measure and our brothers (the ushers) and Ben’s best man had fitted suits too. The boys scrubbed up well – gorgeous. They wore matching pink ties and brown brogues to match the vintage theme. Ben had a navy waistcoat and tie to stand out from the rest. My dad opted for a slick grey suit. 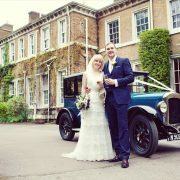 My dad has always loved a Rolls Royce – so I picked a cream vintage Rolls to take us to the church. Let’s just say it was the best car journey ever – the car was lovely. And my dad was his perfect self – a very special time for a dad and his daughter. I walked down the aisle to the Trumpet Voluntary by Jeremiah Clarke and the service was what I’d always wanted – sincere and traditional. 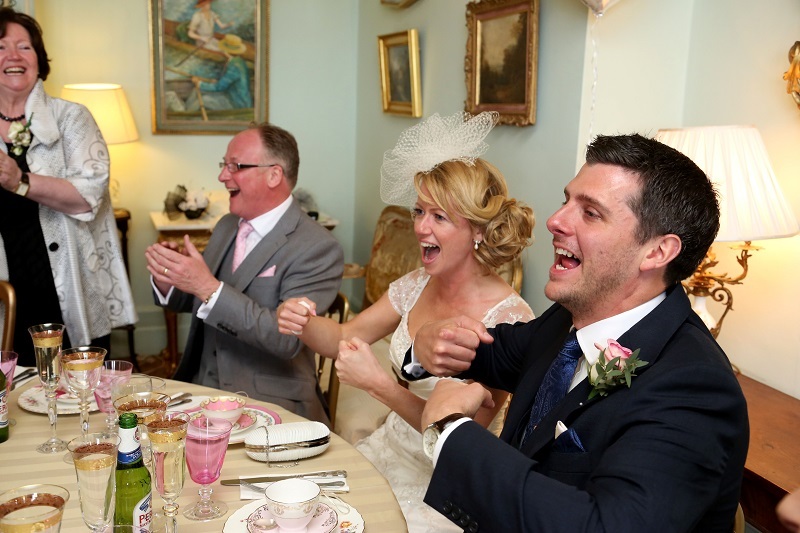 But we decided to surprise the guests with Stevie Wonder’s Signed Sealed Delivered during the signing of the registers and picked It Takes Two by Marvin Gaye and Kim Weston as our exit song – cheesy but fun! 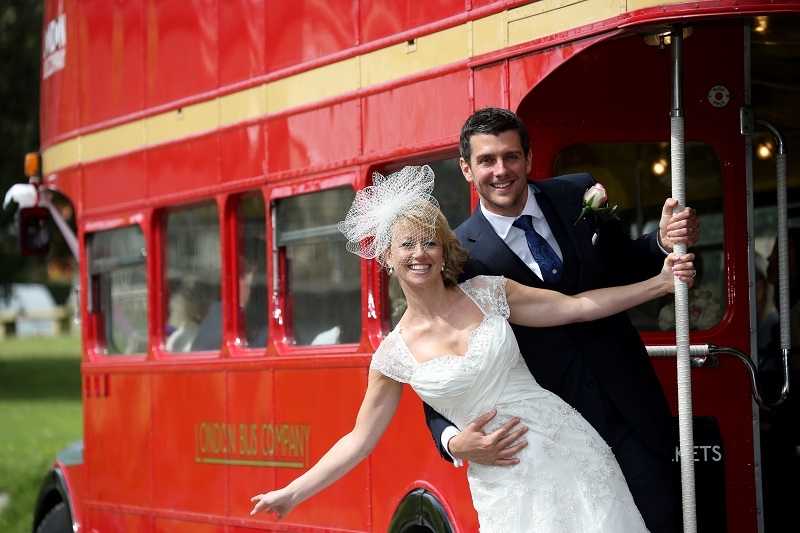 After the ceremony we hired a vintage London Bus to take guests to the reception at Wadhurst Castle – and we boarded too! 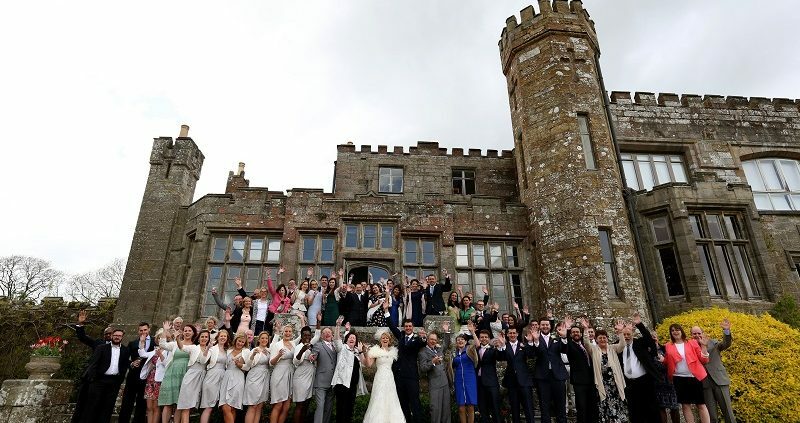 The guests appreciated the gesture and it meant we all arrived on time – and enjoyed the view of the castle together. 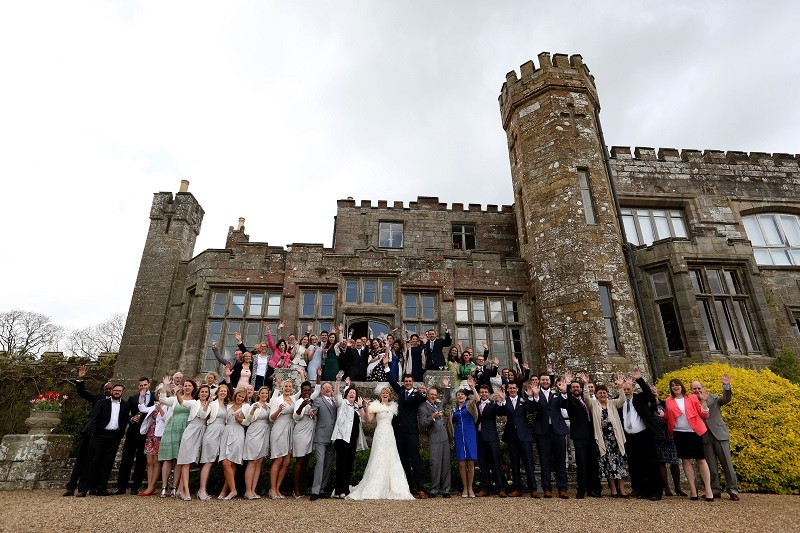 We knew the moment we met Georgina Hovey, the wedding organiser at Wadhurst Castle, that we could trust her to oversee our wedding. She welcomed our ideas and gave us some expert advice throughout the process. The castle is the friendly, intimate and pristine place it is, because of her. 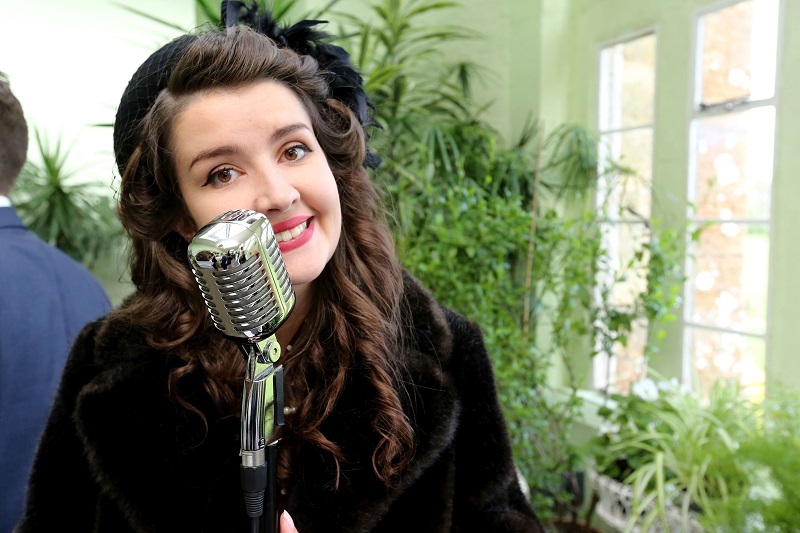 For the reception I found a vintage singer – Madeleine Cooke – who sang some great classics as guests enjoyed Bellinis in champagne saucers and canapes. She dressed the part and kicked off the celebrations fabulously. Ben (who is golf crazy!) 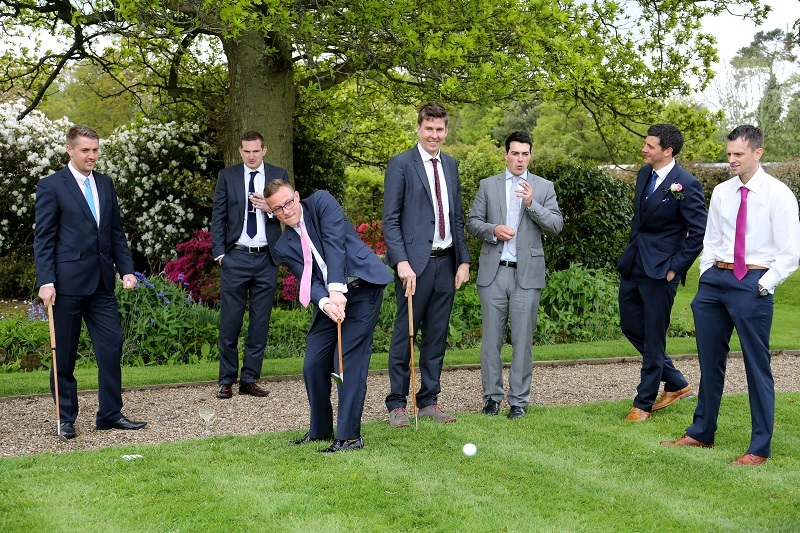 hired an old hickory golf set to keep guests entertained throughout the day – and even the bridesmaids had a go! For months I’d struggled to find table centres that I was happy with and I had my heart set on candelabras I’d seen in a bridal magazine. They were decorated with roses and they were grand and elegant at the same time. 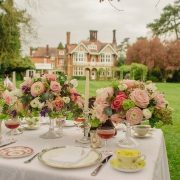 When my florist told me they’d cost £350 per table (x 7 tables) they quickly became a dream as opposed to a reality. After hours of looking for inspiration I discovered ‘Tea cup candelabras’ and luckily Ben agreed to drive us to Swansea and back in a day to collect them. 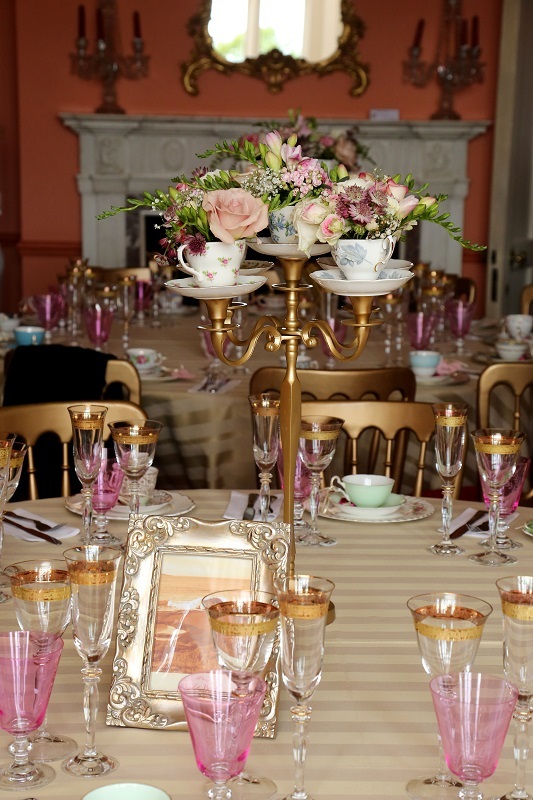 Thankfully my florist, Amanda from Distinctly Floral in Hadlow, did an amazing job with the flowers in the tea cups and they really came to life on the day. My caterer, Sarah Doole from Amuse Private Caterers, was far more than a caterer. She was like my wedding guardian angel! She had the answer to every question, and listened enthusiastically to all my ideas. She really was everything and more you’d wish for from a caterer – gave me peace of mind throughout the process, listened to my ideas and most importantly her food was YUMMY. We had a tea party with homemade pies, sausage rolls, sandwiches, stilton scones, port figs, chocolate brownies, scones, fruit tarts and more! 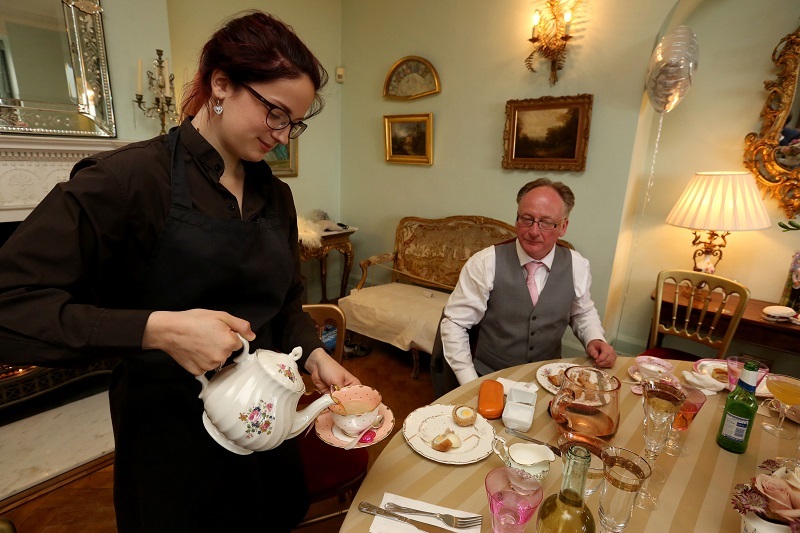 Although our parents had their reservations about us not serving a hot meal, there was plenty of food, and we truly thought the tea party was more memorable, and more delicious, than your standard chicken and veg options. For us, it was exactly what we wanted, and on the day the guests seemed happy tucking into it all too! 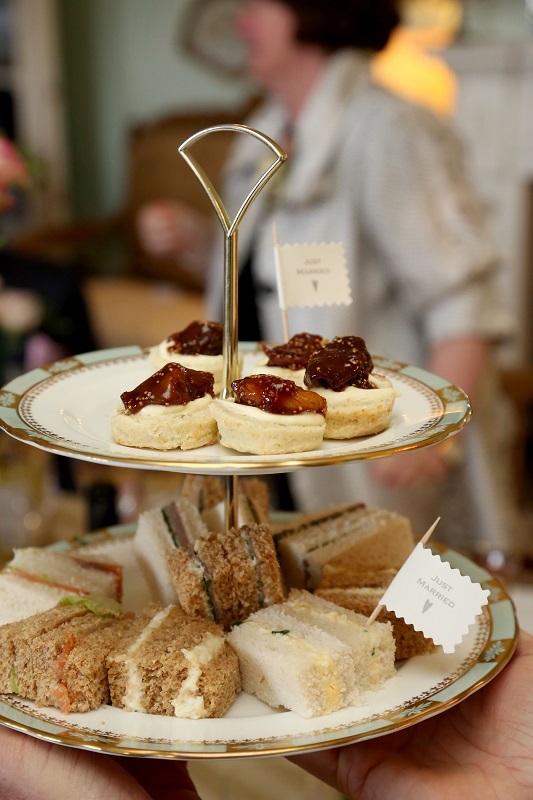 The cake stands are a really pretty addition, and guests can then help themselves to what they like. 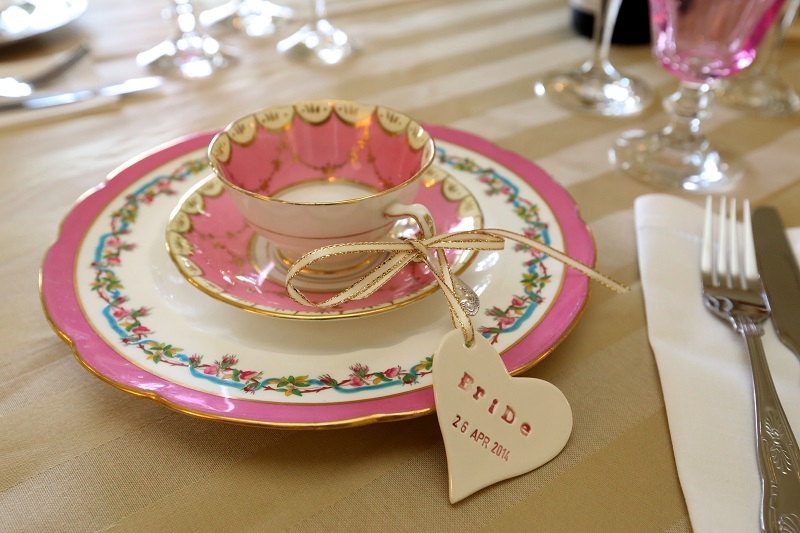 We hired vintage crockery from Vintage Flair – who I knew I had to have when Ellen told me they go for the ‘Ritz effect rather than the chintzy look’ and were so helpful from start to finish. 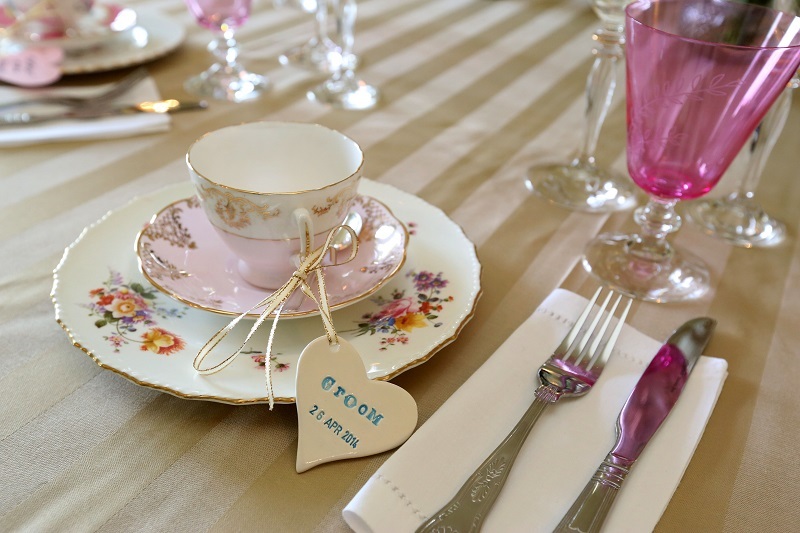 Ellen arranged the crockery in colour groups so that each table had a colour, so the look flowed, without looking too organised. People say you can pick up vintage crockery from charity shops – but I know Ellen and Elizabeth search high and wide to collect their stock. It’s very special. 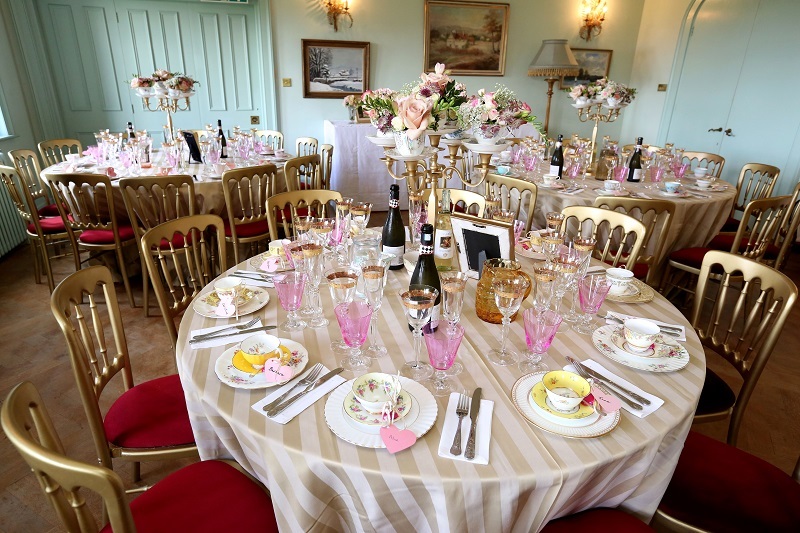 Gold rimmed champagne flutes and wine glasses and pink coloured water glasses that we hired from Couvert in Surrey added a touch of elegance to the tables too. Remarkably, at the castle, the cake has its own room! 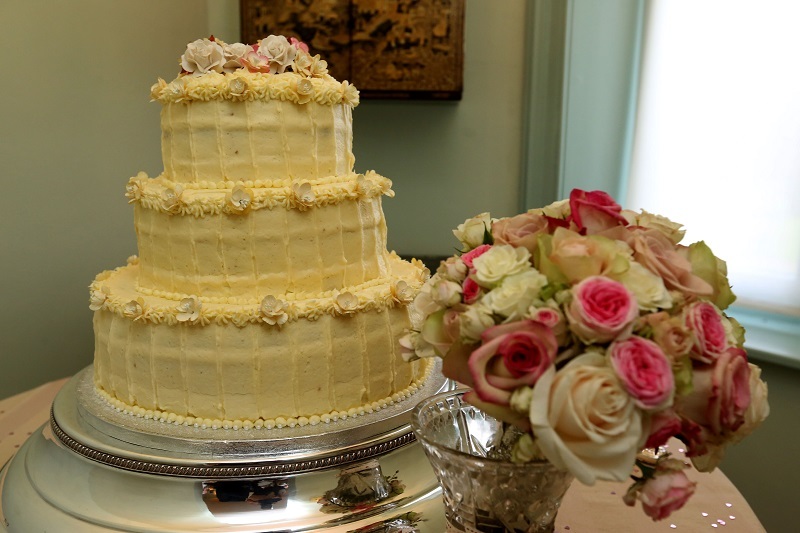 And it deserved it too – my bridesmaid Christina made our cake and it looking every inch a professional design. She took inspiration from photographs I sent her and we agreed on Victoria sponge and butter cream icing. It looked stunning and tasted even better! Along with the church, the speeches had to be one of my favourite moments of the day. My mum and I are very close, and there was no way she wouldn’t speak! In fact, she sang! She sang Let’s Go Fly a Kite from my favourite film as a child, Mary Poppins, and the whole room sang along too – it was amazing. My dad had to follow that which was no easy task. 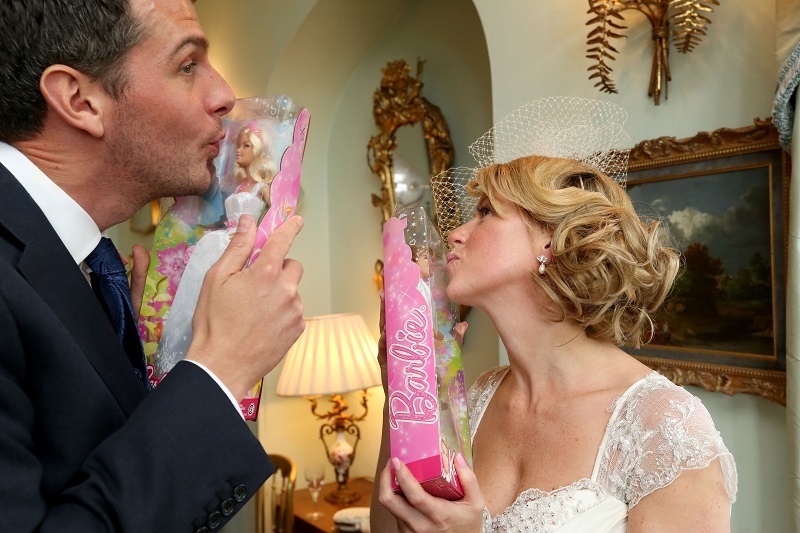 But he did a great job – my favourite part being when he gave Ben and I Bride and Groom Barbie Dolls! – I loved my big dolls house and Barbie as a little girl. Ben’s speech was everything I knew it would be – sentimental, funny and tearful! Two months before our wedding he’d been made redundant and it’d been a difficult time for us both. But as he said in his speech ‘we passed with flying colours’. He thanked me for the faith I’d had in him during that time, which meant a lot to me. We both cried, of course! 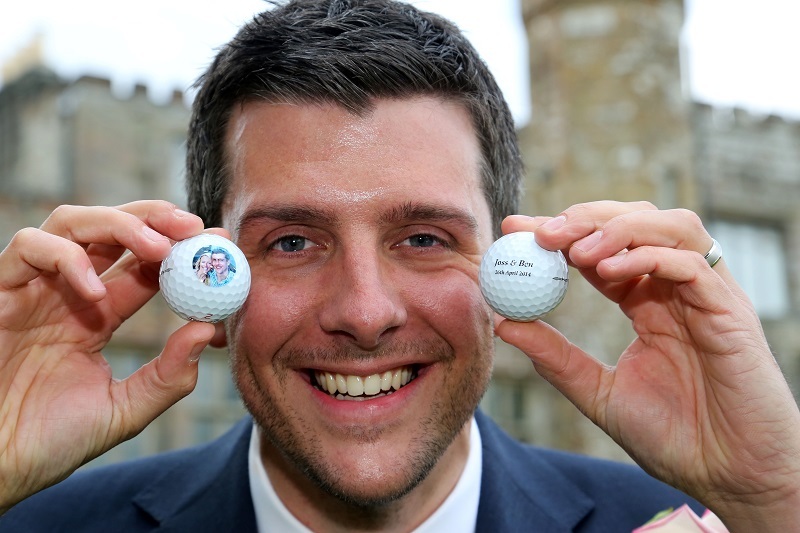 His Best Man blew us away too – his speech included reference to Michael Jackson songs (who Ben loves! ), cleverly dropping in song titles as he wished us both well. Truly spectacular! Our photographer – Stephen Lawrence – was fantastic. He offered to take pictures at the hotel before heading to the church which meant he captured the special moment I saw my dad when I was ready. I cried because my dad looked so smart and then cried more because he cried when he saw me! The pictures are very emotional – this continued throughout the day. He captured every part of the day and got a good balance between sincere, romantic pictures, and fun shots. Ben’s cousin filmed the day for us – the footage is awesome. We’ve already watched it several times! Our first dance had to be a Michael Jackson number. Ben has loved him since he was a child. On one of our first dates we danced in a bar to The Way You Make Me Feel and it became ‘our song’. We didn’t want to perform a routine (neither of us have any rhythm that resembles Michael!) so we were apprehensive about how it’d come together on the day. 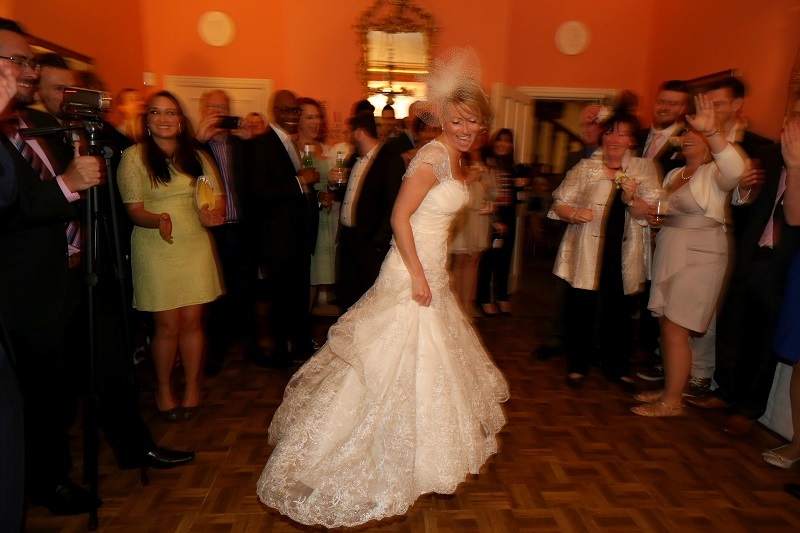 We agreed we’d dance alone to begin with and then pull guests in to join us. But on the day I actually loved dancing with Ben to our favourite song and wish it’d lasted longer. Ben’s parents and brother wowed us with a rock and roll routine after our dance that was a complete surprise – they had some great moves! 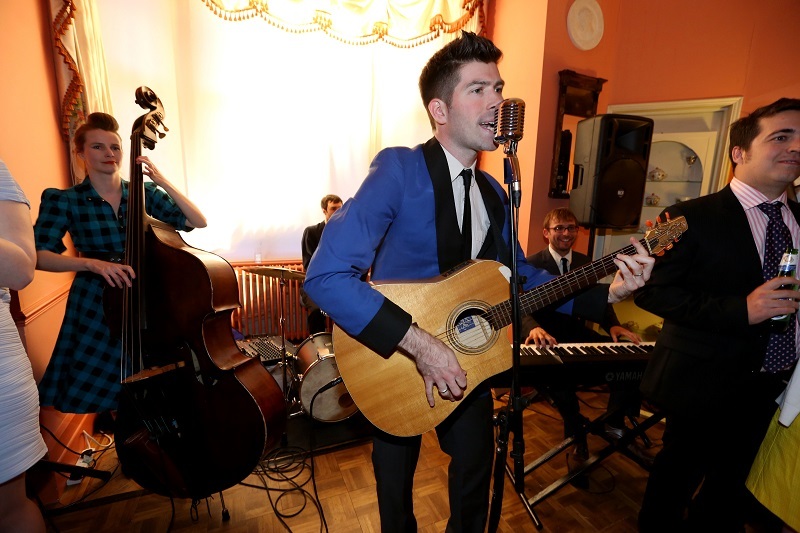 They had dance lessons to prepare and they really paid off – they went down a storm! We decided on a 50s Rock and Roll Band, The Flip Top Floozies, and although we’d watched them online, I don’t think we were prepared for how brilliant they’d be on the day. Even they mentioned how shocked they were by how many guests danced – all night long! Absolutely love them and can’t wait to see them perform at public gigs. We are their biggest fans now! 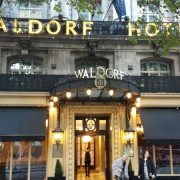 We would like to thank the following suppliers for making our wedding day truly amazing..